Find all the latest updates for new releases, improvements and bug fixes for the month of March. Learn about our UPS Mail Innovations and Asendia services on our carrier pages. Get inspired with our client success stories. Here’s our monthly round up of all the updates and new features we’ve released during February. We’ve added a few new pages to our website. Check them out below! We’ve got the latest round up of all the latest improvements and new features that we’ve released in November. Calgary is open and we’re waiving our delivery fees until the end of the year! Here’s the latest round up of all the features and improvements we’ve been working on over the last month. Surrey branch – Opening November 1: Celebrate with us! Find all the latest updates and new features we’ve been working on since last month. Save time with shipping presets when importing. Contact us if you’d like to be part of the Early Adopter Program. As we approach the busy season ahead we wanted to remind clients to sort and batch your shipments to help ensure your packages are processed in a timely fashion. Need a quick estimate? Use our handy calculator to estimate postage rates quickly. More visibility and updates on USPS’ tracking page. Chit Chats is now recognized as a carrier partner with USPS! 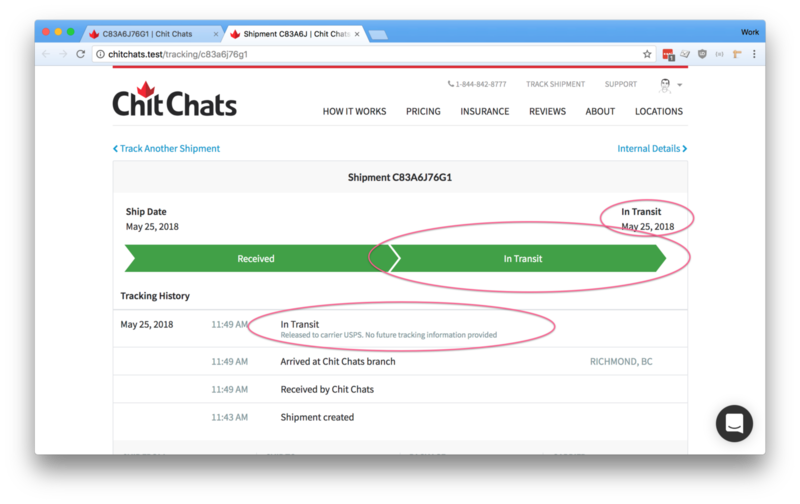 Once Chit Chats processes your shipments, USPS will receive an update and post an event on their tracking page. 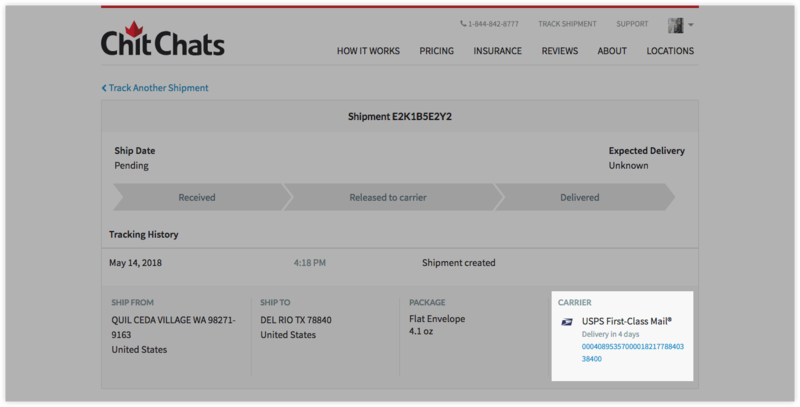 This new tracking event will show your customers their package has shipped and in transit to USPS. 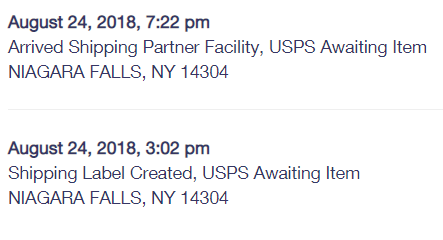 The tracking event will say: Arrived Shipping Partner Facility, USPS Awaiting Item. For eBay and Amazon clients this will provide a tracking event as soon as Chit Chats processes your shipment so there is no delay for waiting for an updated tracking event directly from USPS. This currently only applies to clients who buy postage with Chit Chats. Bulk editing is finally here! We heard your feedback on editing shipments manually and how time consuming it can be. 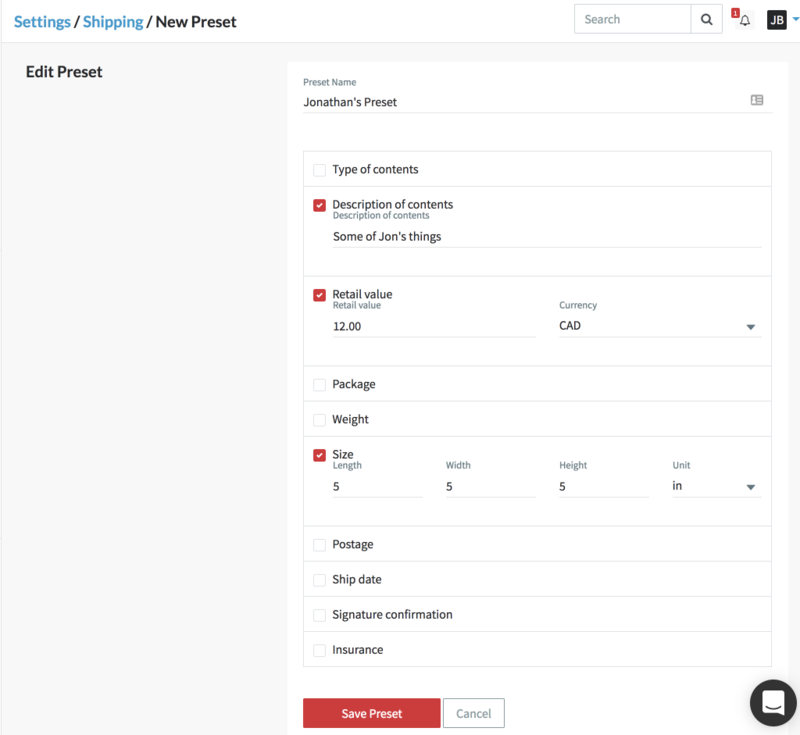 Before you import shipments into your account you can now easily edit shipments in bulk. Integration for eBay clients is available for clients and we need your feedback. Looking to integrate your eBay store or want to learn how to import shipments from eBay contact us to be part of the beta testing of this feature. Your shipments will sort in the same order as your Etsy or Shopify store so you can stay organized. Company Name field will now import from Shopify. Share the love and refer us to your friends. Our latest Referral Program runs from: Aug 16 – Sep 15. Declaration updated on Aug 29th: Don’t forget to read and accept the updated Declaration. Read up on package requirements when shipping batteries to the U.S.
New drop spot launching in North Vancouver. Sign up now to gain access. Find all the latest improvements and new features we’ve released over the last month. Second Burnaby drop spot launched – Gain access here. It’s time for our monthly round up of all the new features and improvements we’ve been working on since last month. Asendia relaunched in Ontario — all known bugs have been resolved. Asendia now available for clients in the Atlantic region. Simplify payments! Use credits to pay for shipping supplies and services. Find helpful tips in our updated rate cards. Shipping can be complicated so we’re here to help. Improved parsing to customer name and address when copy and pasting. New test drop spots in Burnaby, Richmond and Surrey! Sign-up here. keep our rates low and add more services to help Canadian businesses thrive. We’re always looking for ways to offer the lowest postage rates that will save you money and simplify shipping. Feel free to contact us if you have any feedback or questions. Here’s the latest round up of all the new features and improvements we’ve been working on since last month. Carrier tracking is now linked in the shipment details and the Chit Chats public tracking page! 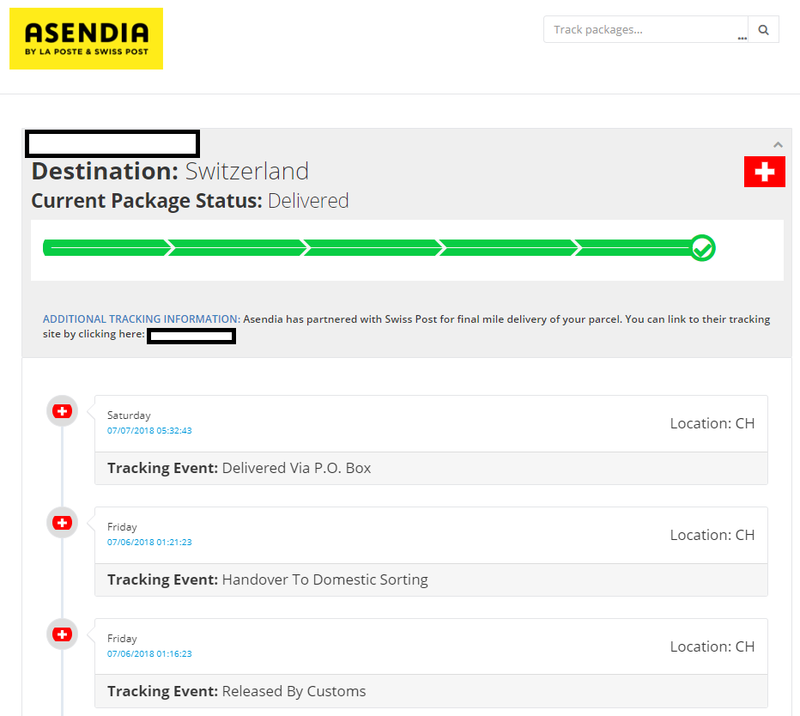 Clicking on the carrier tracking number will directly link to the appropriate carrier tracking pages (i.e. USPS, Canada Post). 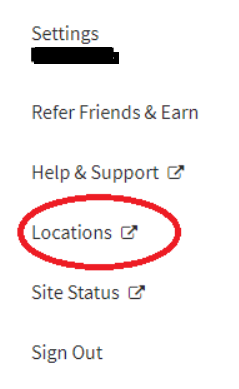 Shopify and Etsy clients that have their store(s) connected can now choose: what type of tracking to send (carrier tracking if available or Chit Chats tracking)and when to send tracking back to customers. Find details on how to update your settings here. Support for ShipStation CSV import and Endicia CSV import for clients that purchase postage through these platforms. Import straight into a batch from the import page. 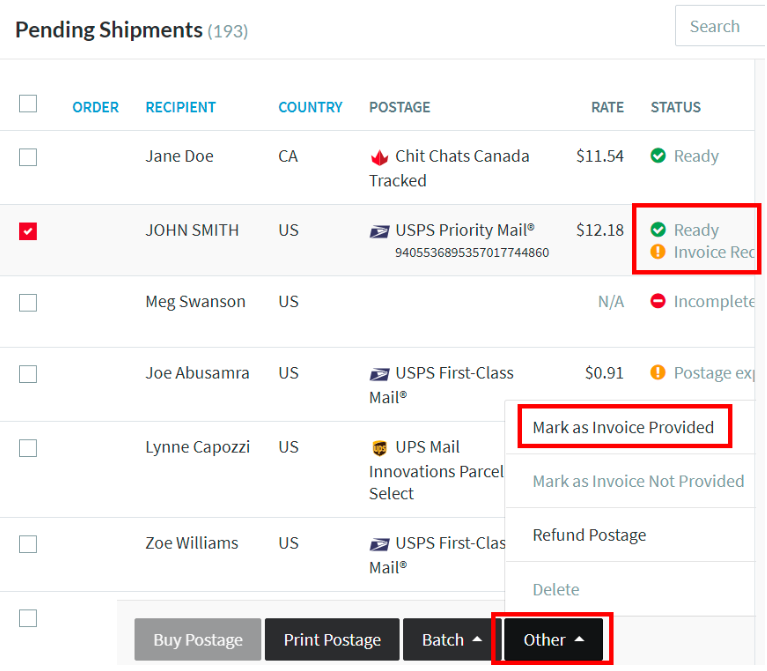 TIP: Create a batch label and group multiple shipments to make processing more efficient. Click here to learn how to batch your shipments. 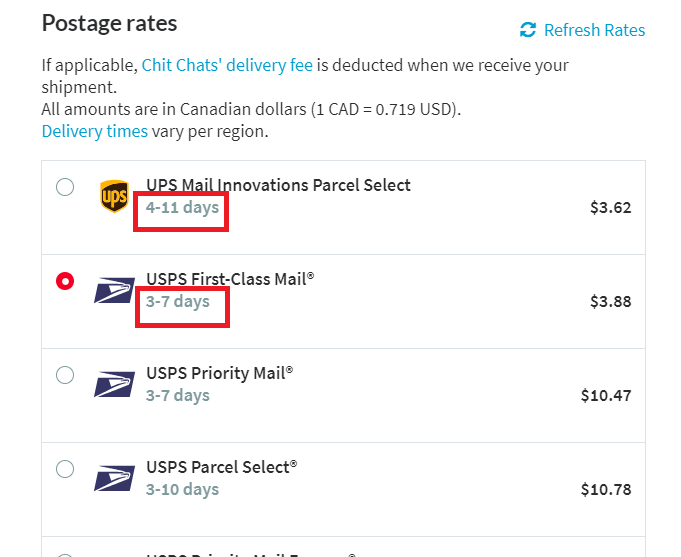 Updates to importing instructions: if you buy postage with Chit Chats or if you already have postage. 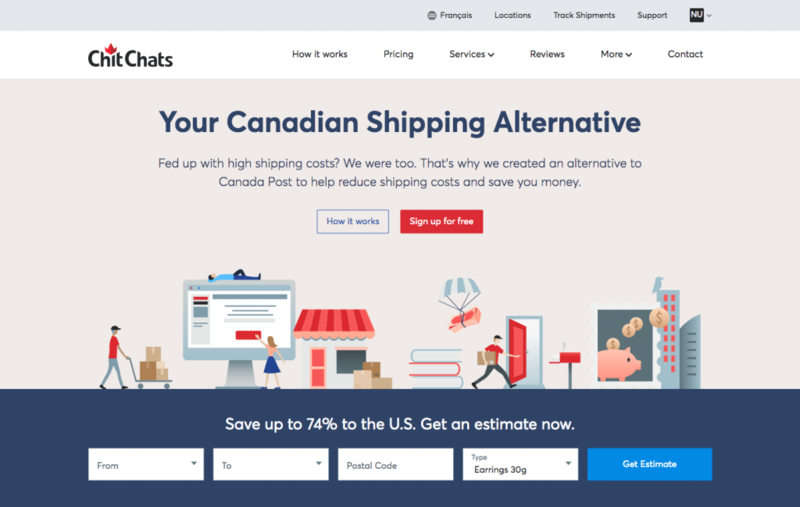 Shopify imports will only include subtotal of goods (won’t include shipping costs). Optimized speed of the search function when searching shipments within your account. Improved alert for any pending fees required to receive your shipments and prevent any delays. Updates to the transaction report: select date ranges and transaction type category in the drop down menu. Find this in your Settings / Credits & Billing / Transactions Report. 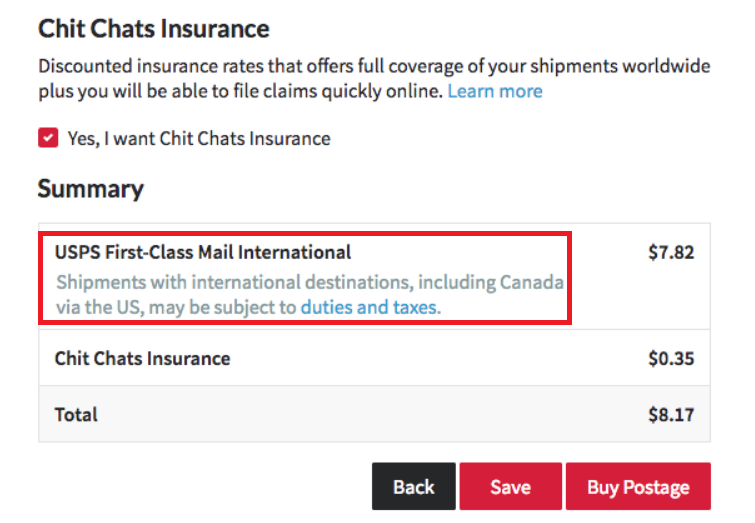 Added description for all international postage as a reminder that shipments with international destinations may be subject to duties and taxes (including shipments destined to Canada via the US). New drop spots in Brampton, Scarborough and Vaughan! Details are coming soon to all those that reached out to us. Thanks for your patience.